Florence Jay (fl. 1905-1920) was a painter of portraits, genre and sporting subjects. She is perhaps most popularly known for her depictions of dogs. 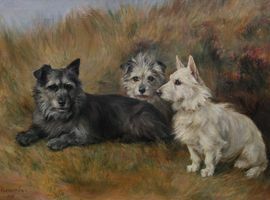 These dog portraits are often worked quite loosely and have a soft feel with more of an emphasis on capturing the dog's expression and the texture of their coat. Little of her life is known although it is recorded that she lived in Peterborough and Liverpool. Jay was a regular exhibitor at the Royal Academy between 1905 and 1908 where she had five paintings displayed. Her work has also been shown at the Walker Art Gallery Liverpool, in 1915 and 1920.